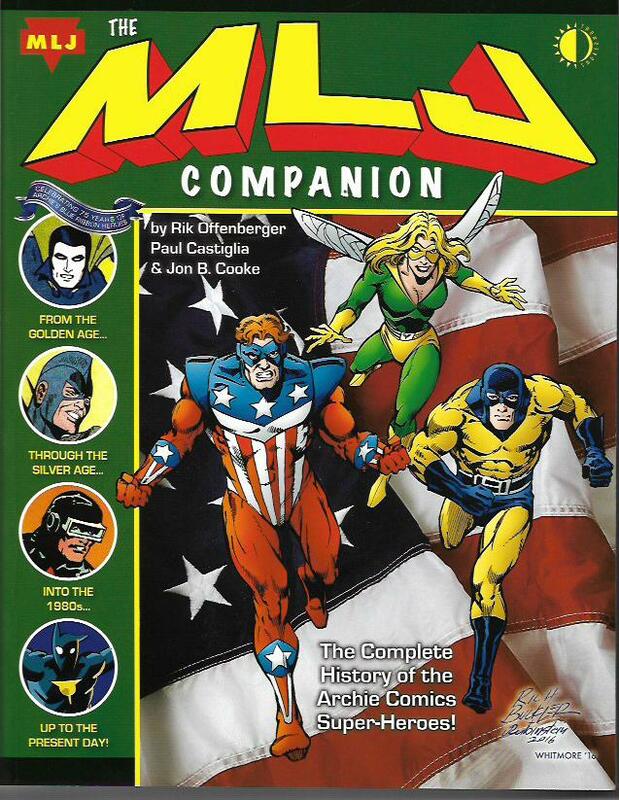 The MLJ Companion [TwoMorrows; $34.95] is a magnificently hefty softcover book by Rik Offenberger, Paul Castiglia and Jon B. Cooke, a 288-page tome which cover-promises “The Complete History of the Archie Comics Super-Heroes!” Given that history commenced with the 1940s and continues to this day, that’s quite the goal the writers set for themselves. That they achieves so much of that goal is why I’m making their volume my pick of the week. Let’s start with sixty pages of classic Golden Age adventures that will be brand new to most readers, including myself. These stories present a pivotal adventures of the Black Hood, the origin tales of Steel Sterling and the Hangman, and thrillers starring the Shield and the Web. From that great start, The MLJ Companion reports on every incarnation of the company’s super-heroes, including a bunch that never saw the light of day. From the 1930s and 1940s, we get a history of the heroes by noted comics expert Ron Goulart, the Black Hood’s adventures on radio and his own pulp magazine, an interview with key MLJ artist Irv Novick, the mercurial Super-Duck, and a wild photo article on MLJ’s super-heroes that ran in a racy magazine by the name of Close-Up. The magazine was published by MLJ prior to the company’s transition to Archie Comics. The 1950s and the 1960s kick off with the rather staid Adventures of the Fly and Adventures of the Jaguar before moving into the wild “high camp” exploits of Fly-Man, the Mighty Crusaders, and Mighty Comics Presents. There’s a quick look at the original Fly Man, who appeared in two 1941 issues of another publisher’s Spitfire Comics; a discussion of Archie’s absurd adaptation of The Shadow, and some thoughtful commentary on whether Jerry Siegel’s “high camp” writing was satirical or just plain awful. The section also covers Archie Andrews becoming Pureheart the Powerful, an honestly entertaining merger of super-heroes with teen humor; and the surprising amount of Mighty Crusaders merchandising of the era. The chapters concerning the 1970s through today deal mostly with a number of ultimately false starts to reviving the Archie heroes by Archie and (twice) by DC Comics. Even those false starts make for intriguing reading. There are interviews with Kelley Jones, Brian Augustyn and others. There are six pages of the Fly script written by Steve Englehart in 1989. There’s an article on the Fly movie that was being pitched in the late 1990s and early 2000s. So much of this was new to me that I’m sure even more of it will be new to most readers…and that they will find it utterly fascinating. I might quibble about whether it’s a “complete” history, but it is, without question, an astonishing history of characters and concepts that intrigue readers to this day. I recommend The MLJ Companion to all super-hero fans and students of that genre. If you’re looking for a holiday gift for that super-hero fan in your life, this book would be a good choice. Neil Gaiman’s Troll Bridge with art by Colleen Doran [Dark Horse; $14.99] is a comics adaptation of a short story by one of our best writers. The back cover blurb describes Gaiman’s tale as a “tragic coming-of-age fantasy masterpiece” and while “masterpiece” might be a wee bit excessive, there is no doubt in my mind that this is one of those cracking good stories that sticks to that place in one’s heart where sighs originate. Jack, the protagonist of the story, is neither a terribly good man nor a terribly bad man. 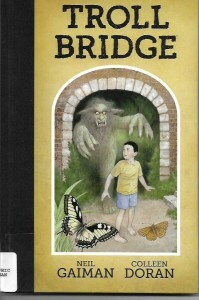 In a childhood filled with imaginary beasts and ghosts, Jack, as a young man, means an actual troll who lives under a bridge in an area that will soon succumb to the “progress” of changing times. He strikes a bargain with the troll and, in some ways, that shapes the rest of his life. Doran’s art is emotional and expressive as it tells the story with nary a misstep. Almost any of the pages would look magnificent on one’s wall. Todd Klein’s lettering enhances both the story and the art. This hardcover book would make a wonderful gift for those who love fantasy and great comics. I find it suitable for all ages, but your mileage might vary on that score. 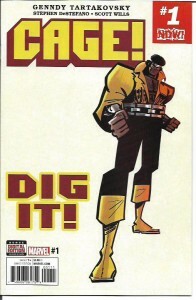 I was excited by the prospect of a Luke Cage comic book written and drawn by Genndy Tartakovsky, whose work on TV shows and movies like Dexter’s Laboratory, Samurai Jack and Hotel Transylvania have given me great enjoyment. His notion of doing Cage in a short of animated black action movie of the 1970s sounded like fun. For me, however, something went wrong between the talented creator’s amusing concept and the actual comic book. Cage! #1 [$3.99] is a too-thin super-hero plot wrapped around some frantic-looking art. Cage runs around walking into scenes that make him look kinda sorta dumb. He finds out all the super-heroes have disappeared, except for the X-Men who show up looking for a missing Jean Grey. By the end of the issue, he’s found several old enemies have teamed up to take him down. Then he gets punched by a mystery man or monster. Cage! #1 fails because there’s no real substance to the issue. We get some delightful artwork and a few moderately funny gags. That’s all. It took me less than five minutes to read the issue. Which is lousy bang for your four bucks. I’m not giving up on this limited series, but I’m not recommending it either. Try to borrow a friend’s copy and see if the comic book is too your liking. You may enjoy it more than I did. That’s it for now. I’ll be back next week with more reviews.